No matter your age, staying active is important for body and mind. Not only do you feel better after 30 minutes of exercise, seniors who stay active can help combat diabetes, heart disease, and even some forms of cancer. Flexibility, balance, endurance, and strength are also happy side effects of moving around every day. However, as summer gives way to fall, the chances to walk around the neighborhood every day become limited. Cold, rainy weather is no fun to spend any time in, and it can make sidewalks slippery. But that doesn’t mean seniors have to sit in a chair for six months. Knights of Pythias provides residents with a fitness room and two morning exercise groups: yoga and sit and stretch. Yoga can be helpful for anyone, even those that are disabled, have problems with movement, or other health considerations. Each pose can modified to suit most fitness levels and some can be performed while sitting in a chair or wheelchair. Yoga can strengthen your body as well as improve flexibility and balance. Our Yoga classes are held on Tuesday and Thursday. Another way to improve flexibility is daily stretching. As we age, our muscles begin to lose some of it’s elasticity, affecting how we move around. Daily stretching keeps muscles and joints in good working condition and can be done at any age. In addition to the benefits of daily exercise, stretching can help with back pain, improve posture, and is beneficial for those who suffer from arthritis. Our Sit and Stretch classes are held at 9:30 a.m. on Monday, Wednesday, and Friday. The best part about Yoga and stretching? It can all be done indoors and out of the weather! Additionally, the fitness room is open until 8 p.m. and features treadmills, stationary bikes, weights, and a punching bag. 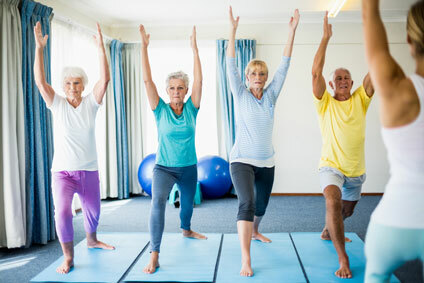 Since we do not have staff available to supervise, we recommend that the residents consult their doctor to figure out what the best exercise regimen would be for them. As with any kind of exercising, don’t over do it. As we get older, our bodies don’t respond like they used to. If you are just getting back into the swing of exercising, start slow until you feel strong enough to work out for longer periods of time. Always have access to water, too – no matter what activity you choose, staying hydrated is one of the most important things you can do for your body. Another helpful tip: choose activities that you are able to do or that you enjoy. This will make it easier to stick with a plan and keep you from getting discouraged. If you can find a “workout buddy,” this will also help keep you on track and you can encourage each other. Contact Knights of Pythias Active Retirement Center and Retirement Home today!